I’ve heard this statement too many times. For close to 10 years, DIRECTV has been working on this issue, and while it’s a lot better than it once was, it’s still frustratingly imperfect. The story goes like this. 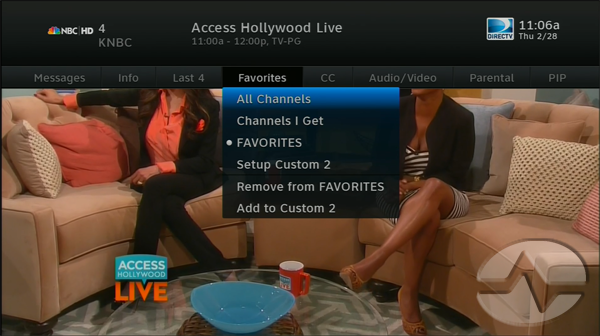 You set the favorites list to “Channels I Get.” (If you need a tutorial on how to do it, check this one out.) You go to tune into a program and you get a message on screen that you don’t get the channel. So, obviously, it’s not “Channels I Get.” What’s the problem? There was a time when this was a HUGE issue. I remember helping out with some data gathering in 2009 and finding out that there were close to 200 channels that were improperly labeled as “Channels I Get.” It’s gotten much much better and now, aside from a few stragglers, the only channels that are problems are pay-per-view ones. Technically you do get those, if you’re willing to pay for them. But yes I understand, they aren’t truly “Channels I Get” with your current package. Of course, for those of us with a technical bent, we have to wonder what took so long. You’d think that it wouldn’t be that hard since the access card does have some ability to know which channels can and cannot be viewed. But somehow that logic didn’t translate into a proper “Channels I Get” list until recently. Perhaps it simply wasn’t a priority until DIRECTV started rolling out features like far-in-advance scheduling, Restart, and 72-hour Rewind. These features depend on the receiver being able to choose a channel that the customer will definitely be able to receive, and features like the “All Seasons/All Channels” search that was implemented this year really rely on the receiver choosing a channel that the customer is able to see. While it certainly does seem like it’s taken a long, long time to squash this particular bug, it goes to show the hard work and dedication of DIRECTV’s team of engineers on the ground, working every day to make sure that customers have the best possible experience. Most DIRECTV customers aren’t really aware of it but there is usually a full software rollout that goes to almost 40 active receivers, every three or four months. Usually it’s a matter of adding one or two features and a bunch of stability fixes, but the fact that most customers don’t even know it’s happened means that the engineers have done their jobs. Like elves, they work best when they’re working in secret. In the meantime, if you do have problems with the “Channels I Get” feature, let me know by leaving a comment below. I’ll make sure the reports get to the right people!